Last week of April, I was rushed into the hospital due to the virus roaming around the city but I'm good now. I just got home from the hospital because my sister was rushed there due to abdominal pain. So this time, I'm not the patient but a watcher along with my mom. I'm telling all this to justify the fact of being missing-in-action on my blog and other social medias. Since I'm home, it means I'm giving a little time for me to catch up on my blog. So, let's do this. Being a watcher isn't that easy because you have to go to the pharmacy, nurse section, information center, and others. So having to walk and run from places to places makes us haggard and pale. But this time, I got a lip tint with me to keep me looking fresh and blossomed every now and then. If you've been my reader since then. You know that I don't wear make-up, but soon I've been thinking of doing so, like a minimal make-up, just that. So if you want to recommend products for beginner, please leave it the comment section below because I need all the help I can get, because I really have no idea in this world of make-up. 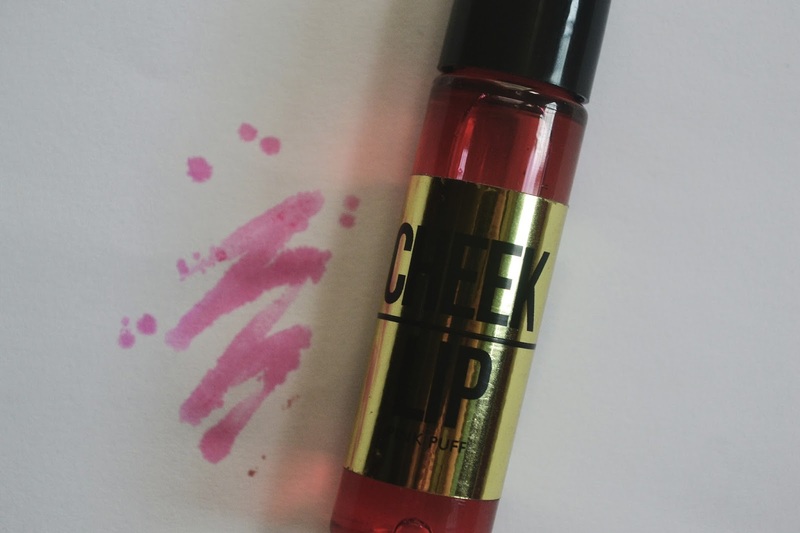 I got the product's information from Sofia Andres who's been posting this cheek and lip tint on Instagram and she really liked the product. So I thought of trying it out, and when I got it I was really excited. I prefer wearing lip tints because basically lip tints give you a more natural look than lipsticks. I bought the colors in Pink Puff and Bittersweet Magenta. What I love about Pink Puff is you can wear it anywhere and it'll suit you. It also looks so naturally rosy which I believe can make you look blooming. I usually just use it at home or outside the house. I wear Bittersweet Magenta when I'm going out to the mall or somewhere just to keep you tidy and look fresher. The color isn't too dark on your skin so the tint still gives you a natural look. I personally love the packaging because it has gold. And the bottle is adorable because it reminds me of the bottles in a medieval movie used to poison their enemies, I don't know why but that really reminds me of it. It actually shocked me how long lasting it is because even I brush my teeth, it still hadn't come off. Sometimes I sleep with it and in the morning, it's still there. Good job, KJM! 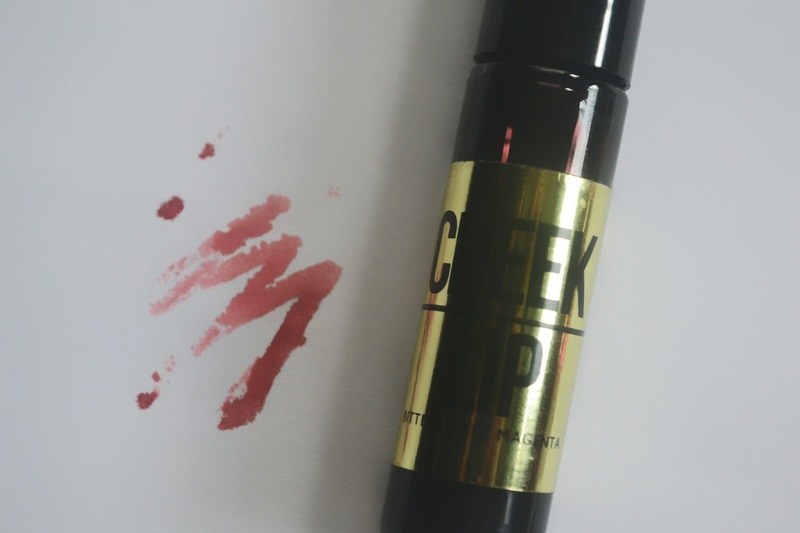 Of all the lip tints I've tried, this KJM cheek and lip tints are the only ones so far that hasn't chapped my lips and hasn't left my lips dry. It's not that balmy and too dry, it's just normal and natural. That's the main reason my why love the product. Not as if I'm expecting the tints to be sweet or fruity. But in someway, the taste actually disappoints me because I personally don't like chemical-taste lip product. What's good is, the taste fade when your lips are already dry. For more information, just click the logo above. There are a lot more pretty colors available, just click on their site. And order now. This is my first ever review of a product I use. I hope you liked it and believe what I wrote because I promise everything I wrote here are legit. Looking forward on doing lots of reviews in coming days. Do you also wear lip tints? Let me know what your fave brand. She's fine now, thank you. Go for it, it's worth it! They really are, even long lasting. I know what you mean about the taste, I can't stand really chemical tasting lip products! I know right. But this fades when your lips are dry. Hope your sister will feel better soon. Beautiful post and review. Eeeew I don't like chemical taste in my lip products either, so that's a pass for me. Ahw thank you, she's doing fine now. Thank you. Don't worry, the taste fades when you lips are already dry. Thank you, Kelly. Definitely gonna try the Maybelline, I need to start somewhere in the beginning. Thanks for the suggestions, it means a lot. Wow good review. I love the first one! Thank you, Laura. I love it too, I use it everyday. Thank you, Taislany. Haha, I love them too. Thank you, darling. It means a lot. I hope your sister is feeling better! I hate hearing about others admitted to a hospital. They bring me horrible "nam flashbacks". Only lip tint I've used was NYC smooch proof lip stain. My only complaint is that is dries your lips. Bittersweet magenta is my favorite shade of the two. Oh yeah, she's doing fine now, thank you. Ahw I personally hate hospital but it's inevitable because we'll never be completely healthy, lol, especially when we always indulge. Ahww that's alright, but we're always open to learn something new, right? Oh I see, I need to check that out coz I love lip tints so much. Thanks for dropping by, Harlynn. Yeah, I pretty love them. Take your time with the blog, health comes first! I hope everything turns out okay for your family! Lip tints are amazing, although I haven't found one that seems to have everything like this one! The one I have is not long lasting at all, even though the color and formula are great. If you're looking for a more minimal makeup look, you should also look at Glossier. I know they're not the cheapest, but they're the first thing that came to mind. Plus they don't have tons and tons of products, so it's pretty easy to get the basics. Their Gen G lipsticks (I think that's what they're called) I've heard are a really good "my lips but better" kinda deal. Ahw that's so sweet, thank you. Oh I need to check Glossier out, thanks for you suggestions, it means a lot. And thanks for dropping by. I hope you're feeling much better now, Fads. I've been looking for a lip tint to purchase but dislike the too-pink shades Korean brands often offer. Bittersweet Magenta is more up my alley. They sound like fabulous products, thank you for the review! Yeah, I'm fine, thank you. Go order the Bittersweet Magenta now, I know it'll suit you very much. You're welcome and thanks for dropping by, May. Love the pink puff shade and it sounds like a great lip tint despite the taste. And I hope your sister gets better soon. I love these lip tints! Ahw thank you, she's doing fine now. Oh yeah! Thanks for dropping by. Salam! I love the shades! I'm into reddish and dark shades now. Salam lovely! Ahw I see, you've been slaying them shades. As you tested lip tints, color shades are very nice :) I love Etude House lip tins, one of their oldest collections (still alive). They are cute and easy to use! You have very nice blog design, by the way. I've been seeing these Etude House Lip Tints everywhere (those lip tint lovers). I must grab one! Thank you, Nana. Love the yay or boo concept with the review hehe, tints are great for minimal makeup and last so well!